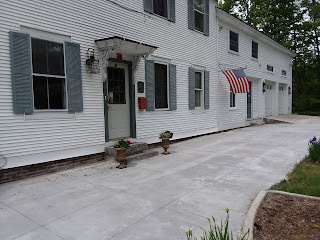 We love to keep the Bridges Inn in tip-top shape both inside and out. We’re continually upgrading and improving the interior of the building. In Spring 2018, we concentrated on the exterior, tackling some much-needed work on the grounds. We began by having McClure’s Tree Service prune the huge maple trees, including removal of problem branches. Sadly, one unhealthy maple tree and one oak tree had to be removed, which we knew was better to be done proactively than to wait for a storm to take them down. Trimming the trees has helped make the yard look much neater. The next project was to replace the greatly deteriorated concrete carriage path, which was done by Wilder Excavating. First the old concrete had to be removed; then the surface was filled with sand; metal rods were carefully positioned to reinforce the cement; then the cement was poured. The final task was to pave the gravel parking lot, which had deteriorated over the years and got a bit muddy when it rained. M&L Asphalt Services LLC did the paving, first removing the material that was there and then filling and leveling the surface before applying the asphalt. 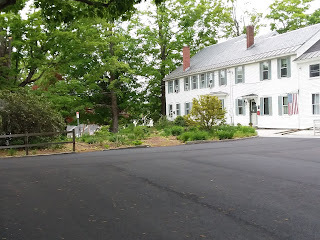 The parking lot looks so much nicer and will be much easier to maintain in the winter. We were pleased with all three contractors. These improvements to the grounds feel like such an accomplishment! And our guests have been complimenting us on the appearance of the property. We're not quite done for this year's projects. The pathway going to the back of the house still needs to be redone and we’ll continue to work on landscaping.